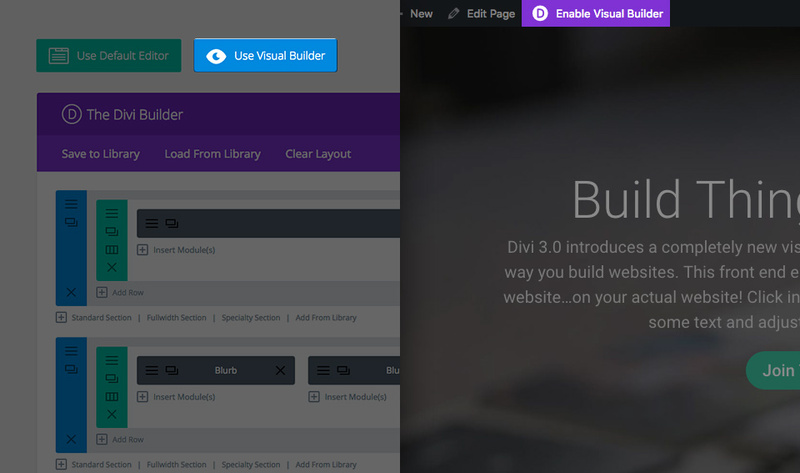 The most basic and largest building blocks used in designing layouts with Divi are sections. These are used to create large groups of content, and they are the first thing you add to your page. There are three types of sections: Regular, Specialty and Full Width. Regular sections are made up of rows of columns while Full Width Sections are made up of full width modules that expand the entire width of the screen. 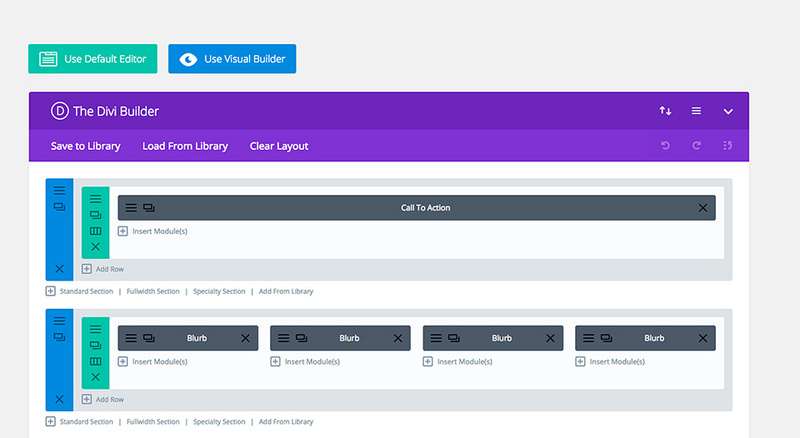 Specialty sections allow for more advanced sidebar layouts. For more information about using sections, head over to our in-depth sections tutorial. Rows sit inside of sections and you can place any number of rows inside a section. There are many different column types to choose from. Once you define a column structure for your row, you can then place modules into a desired column. There is no limit to the number of modules you can place within a column. For more information about using rows, head over to our in-depth rows tutorial. Modules can be added inside of rows, and each row can house any number of modules. 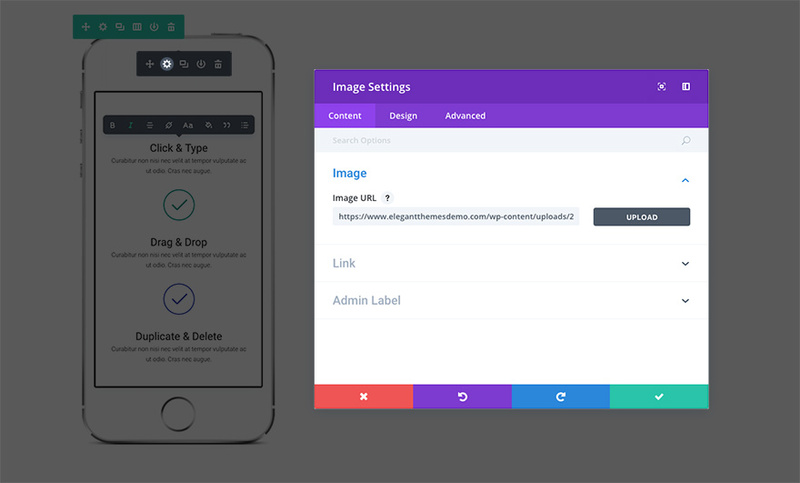 Modules are the content elements of your page, and Divi comes with over 40 different elements that you can use to build with. You can use basic modules such as Text, Images and Buttons, or more advanced modules like Sliders, Portfolio Galleries and eCommerce Shops. 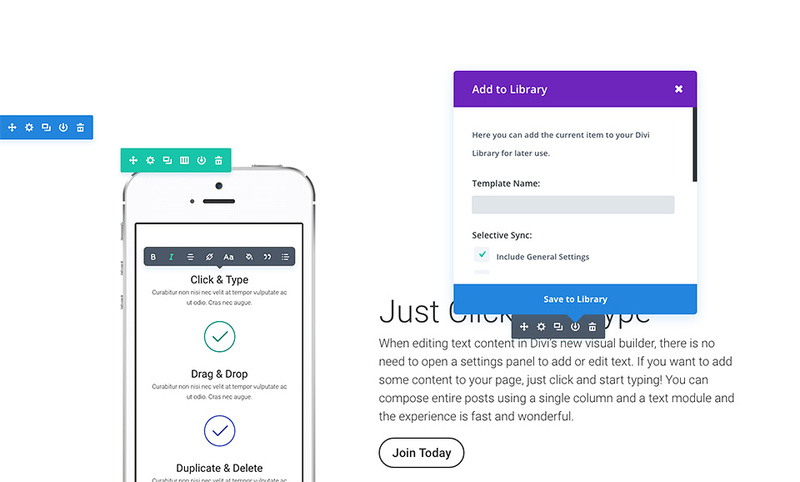 We have individual tutorials for every single Divi module, so if you want to learn more about the types of modules that Divi provides then be sure to head back to the main document page and browse through the “Modules” section. This will launch the settings panel for the specified element. Each settings panel is broken up into three tabs: Content, Design, and Advanced. Each tab is designed to make accessing and adjusting Divi’s large variety of settings quick and easy. The Content tab of course is where you can add content such as images, video, links, and admin labels. The Design tab is where we’ve place all of the built-in design settings for each element. 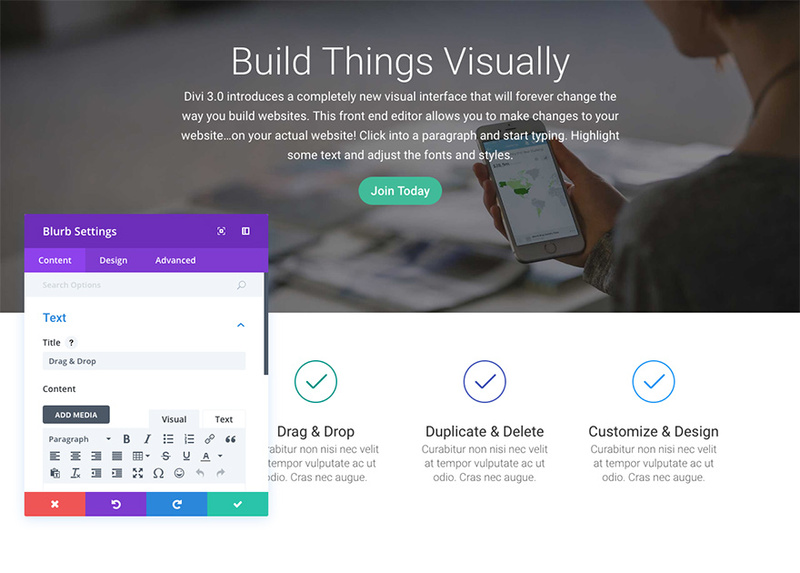 Depending on what you’re editing you can control a wide variety of design settings with a click; including: typography, spacing (padding/margin), button styles, and more. For an in-depth look at the Design tab, take a look at our design settings tutorial. Finally, if you want even more control you can head over to the Advanced tab where you can apply custom CSS, adjust visibility based on device, and (depending on which element you’re editing) do even more fine tuning. 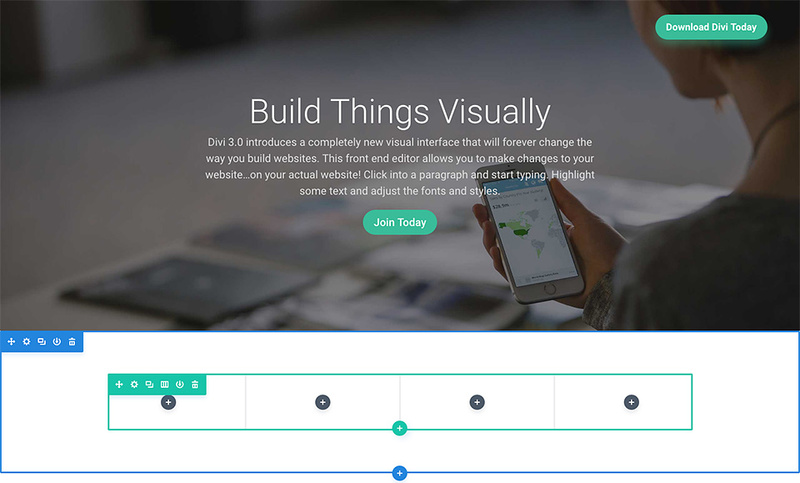 A great way to jump-start your new page is to start things off with a pre-made layout. Divi ships with over 20 pre-made layouts that cover a variety of common page types, such as “About Us,” “Contact,” “Blog,” “Portfolio,” etc. You can load these up and then swap out the demo content for your own. Your new page will be finished before you know it! To learn more about using pre-made layouts, be sure to take a look at our in-depth pre-made layouts tutorial. So by now you have added your first sections, rows and modules to your page. You have adjusted their settings and begun building and customizing your design. You have the basics down, but there is so much more to learn. We have dozens and dozens of tutorials that cover every single aspect of Divi. I encourage you to head back to the main documentation page and read through each and every one. By the time you are finished, you will be a Divi master!